Do you experience difficulty in dragging yourself out of bed every morning? Especially if it is on a Monday morning? All you feel like doing is to stay below the sheets and sleep forever? We would think that there is nothing unusual about this since if we were to ask around, many of our friends seemed to have the same predicament. Statues of little novices sleeping peacefully. 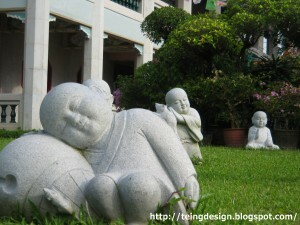 Taken in Kong Meng Shan, Singapore. However, if the issue gets more serious, ie you wake up everyday feeling more tired and demotivated- and you do not seemed to have any energy to greet the day- it could be an indicative of what you truly feel inside…. that…. Subconsciously, you are not looking forward to life. Why? Because deep down, you may be very unhappy but does not know it. Or living the kind of life that you actually do not want. A lot of inner unhappiness and discontent gets masked by compulsive shopping, addiction, substance abuse, etc. Most of us know that habits like smoking, overeating are bad for our health and compulsive shopping makes us broke but seemed powerless to stop it. For many, there are lots of inconsistencies between our conscious and sub-conscious mind. We tend to go through life as how we have been conditioned from young that had to be. There are expectations, responsibilities and shoes that we need to fill. Sometimes, we are compelled to lead our lives in accordance to an unfufilled dream or a parent, guardian or a spouse- it it is not the life we truly want. Unfortunately, we would have shut down the voices coming from our minds or hearts for so long that we no longer hear them. And the message continues to come across- the more we deny them, the worst they manifest- into unexplanable headaches, depression, chest pain and….. not wanting to get up from bed. I remember years ago, there is a beautiful young girl who worked in my department. The job is not something she really liked to do- but she figured she had to to earn a living. Few years later, her hair starts to drop- in patches. She is very young and have very beautiful thick natural curls. But she was losing so much of hair that she had bald patches all over. That really threw her into depression and lower her confidence level. She then had to resort to wearing a wig to work- it is really a blow to someone who is young and pretty. Everyone knew she was wearing a wig but no one dared to talk about it because she often cried due to the matter. Another blow to her already low self esteem- she had also gotten married and find herself unable to conceive- both she and her husband wanted a baby so badly. Nothing abnormal showed up in the medical check-ups. She could not find what was wrong with her and slowly, her depression got worse. She was also having problem controlling her anger. Her husband insisted that she quit her job- and after suffering for about a year to two, she decided that the money was just not worth the price to pay with her health. Within a year after quiting the job, she got pregnant. She gave birth to a healthy baby. When she came back to the office to visit us, she looked so fresh and she had the thick curly hair. At first we wondered where she had bought that high quality wig from- it seemed to look so natural. The wig must be very expensive. Someone gathered the courage to ask her (because we were all so curious) and with a broad smile she declared: ‘Eh, this is not a wig! It’s my real hair- if you don’t believe, try to pull it.’ We actually had to try to tuck at it in order to believe it. She is back to that bubbly and cheerful girl that she once was. Still, in every major decision in life, there is always a price to pay. Sometimes, a person who have lots of commitment cannot just leap into the unknown and take too much risks because he/she still have to put food on the table and pay the rent/expenses/loans, etc. It does not mean that we have to be miserable if we feel that we are stuck in a life that we do not want. If we cannot change our circumstances, there is always one thing we can change- ourselves. We can change our outlook in life. We can change how we view the situation- from a negative or positive point of view. I have great admiration for one good friend of mine. Years ago, when I first knew her, she was full of pessimism. She hated to get up in the morning, her job, her husband, her illness, her boss, etc- then, she started attending motivational courses, read lots of motivation books- previously it was books from Louise Hay and Law of Attraction. The difference between her and million others who read these motivational books/attend courses is that she earnestly put what the authors say into use. Today, she is a changed person who embraces her life, learn to let go of negativity, practice forgiveness – and very optimistic. Her job is really highly and terribly stressful but she has since learned to manage her stress and handles all situation positively. Truly, it was a remarkable transformation. 2. Live the same life, but change how you view and deal with it.